The greatest love story of all time, our relationship with Christ as his church the bride. We can experience joy, strength and comfort in His deep love for us. His love never fails us and there is security in knowing that deep in our heart. Karol Ladd takes us on a devotional journey through 1 John, following in the Holy Spirit inspired words of John, beloved of Jesus. John was confident in his love and relationship with Christ and sought to share that we as followers can have that also. This book works fantastically as a morning devotional. Karol focuses on a specific passage in 1 John, relates it to a story or time in her or someone she has mets life. Relates it to us. 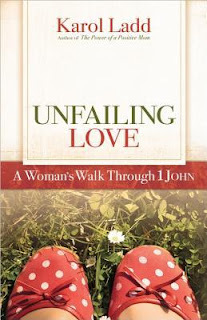 Shows us how John came to that passage, and encourages us to grow. She assigns additional reading at the end of the lesson, and that was helpful to me in delving in a bit deeper in the word during my time. Experiencing true love, the dream of having the greatest love story ever told can happy in your relationship with Jesus if you will let it. I received a copy of this book from Harvest House in exchange for an honest review.